The Shadow Theatre of Anaphoria Island, like the island itself, prides itself in being a home for the marginalized, the obsolete, the exiled and the extinct. It finds gratification in allowing itself to be a meeting place of different cultural and symbolic elements dealing with contemporary spiritual and social concerns. This has lead to the theatre in attracting and creating characters and narratives not usually found in the world of shadow theatre to speak regardless of their life form. 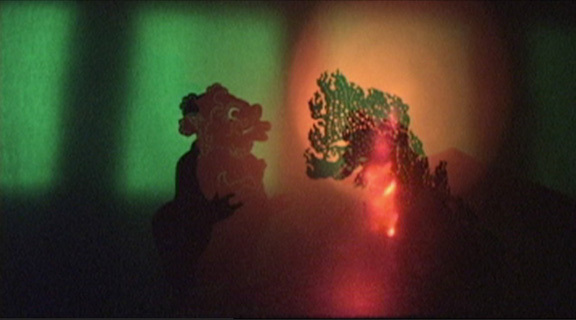 Founded in 1996, performances of our shadow theatre have included presentations at The Norton Simon Museum of Art, The Pacific Asia Museum (Los Angeles), New Langton Arts (San Francisco), The Stella Adler Theater (Hollywood), and served as the resident company of the Folly Bowl, a special outdoor amphitheatre constructed to provide a unique environment for our work. 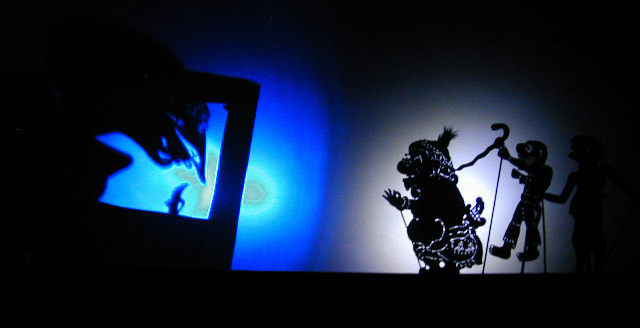 The Shadow Theatre of Anaphoria appears to be the first shadow company to use puppets from a wide range of shadow puppet traditions. It recognizes each as an exile in Anaphoria, retaining their identities while widening their perspectives as they encounter others. Out of great respect, we carefully act to prevent the mere secularization of sacred objects. More details of our history and underlying spirit can be found on this page below. 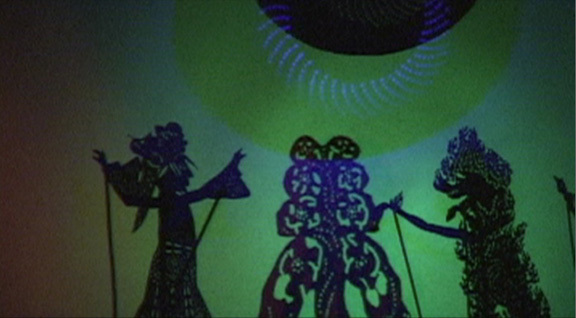 The instruments of the shadow theatre can be seen here. The Story of an Anaphorian Prenatal "Robin Hood"
599 Long Beach Blvd. at 6th St. Long Beach . TEN BLACK EYE was presented at Stella Adler Theater Oct. 27, 1996 and was Assembled by Kraig Grady, Roger Mexico, Brad Smith, and Yelena Tokman. The title TEN BLACK EYE comes from the Anaphorian word, ten, the word for shadow, and Black Eye the translation of the word Fum, a character found in these stories. Mt. Meru is the holiest of mountains as well as a divine mathematical sequence. TEN BLACK EYE is an exposition into some of the fundamental beliefs behind the medium of the shadow play. The shadow world is understood as an intermediary world between the living and the dead. The characters Prince and Fum examine their paths to truth. TEN BLACK EYE II was presented at the Pacific Asia Museum Nov. 8 1997, and was assembled by Kraig Grady, Laura McMurray, Roger Mexico, Laura Pedretti, Genee Pytlewski, and Joe Seely. 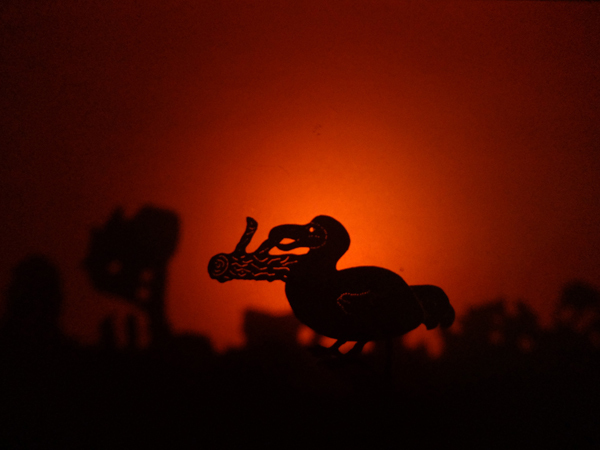 In recent years , The shadow play has experienced an explosion of new works. One dominant force has been the playwright known as Isafa. There is a mystery that clouds the identity of this individual. Only through selected puppet masters, sworn to secrecy, have these plays been made public. Rumors have varied from Isafa being a woman of notoriety to Isafa being a collective endeavor. All these rumors have to be looked at as just that-rumors. The unique style though points toward a remarkable individual of unique vision. As opposed to a strong narrative, Isafa presents us with a labyrinth of signposts. Although linear, Isafa's devices have a way of potentiating our own personal interpretations. A work in progress version of BLACK EYE MERU was presented at Glaxa Studios Oct. 25 1998 and was assembled by Erin Barnes, Geoff Brandin, Kraig Grady, Ryan Hildebrand, Roger Mexico and Angela Sanderson. 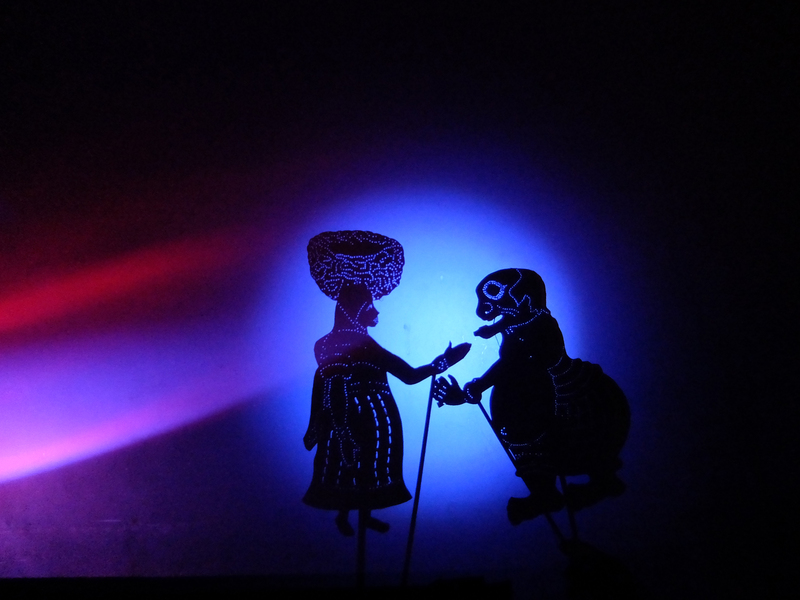 The plays of the Shadow Theatre of Anaphoria present the mythology of Anaphoria Island, complete with love stories, moral tales, battles, spiritual quests, and urban legends. Its themes include supernatural forces, spirits, animals with voices, and other magical possibilities, or deal with contemporary subjects such as immigration, the ethics of science, or the corruption of empires. 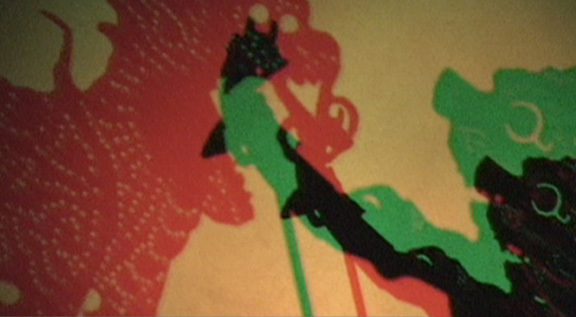 The puppets reflect the essence of the Shadow Theatre of Anaphoria. They draw upon different puppetry traditions from around the world as well as the unique characters found in Anaphorian narratives. Some of these include female puppets that are absent in traditional shadow plays, including a doctor, a shoe-thrower, a sleepwalker, a pregnant woman, a femme fatale, or a philosopher carrying on her head a large basket resembling a brain. Some of the other puppets in the Shadow Theatre of Anaphoria include a beggar, an exiled couple, jailkeepers, clowns, surveillance officers, a puffed up “hero”, angry crowds, and various animals. A few celebrity puppets have been used in cameo roles, but the focus is always on characters from the lower classes who would otherwise be homeless or marginalized by more mainstream media. 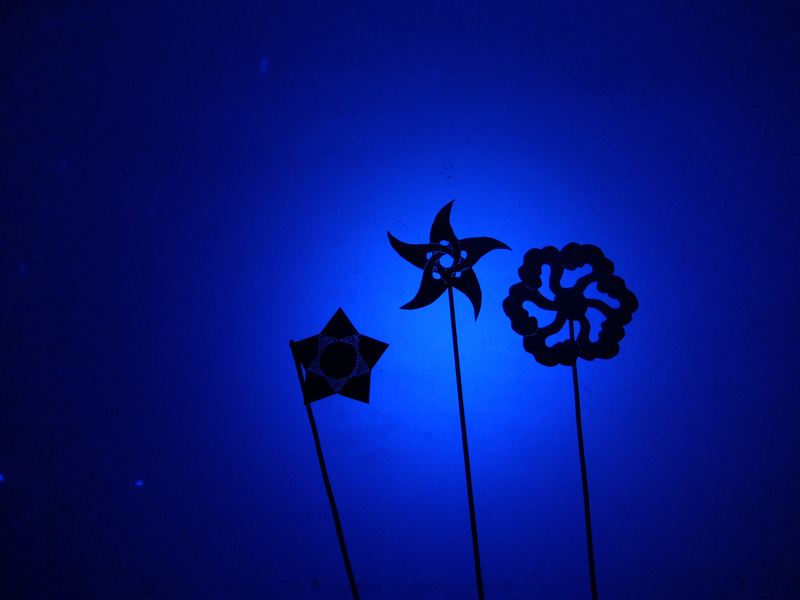 Almost like antennae, the puppets tend to pick up and infuse what is in the air into the narrative of the play, resulting in each production being unique. 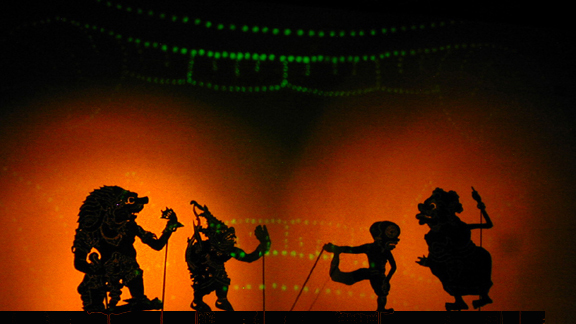 The Anaphorian shadow play owes a great part of its development to the immigrants and exiles coming from such diverse regions as Indonesia, India, Turkey, and Greece. These rich traditions served as a further inspiration to an already growing art form. 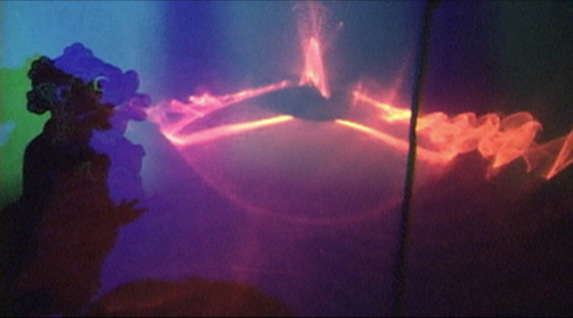 Anaphorian shadow plays have developed beyond a mere synthesis of influences into a creation of their own unique theatre. Legend states that Prince Mita on the death of his bride enshrined her image in shadow. It was under his great patronage that the shadow play blossomed establishing such classics as "The Three Frivolous Battles" Throughout history these traditional epics have been augmented with explosions of new myths and stories. 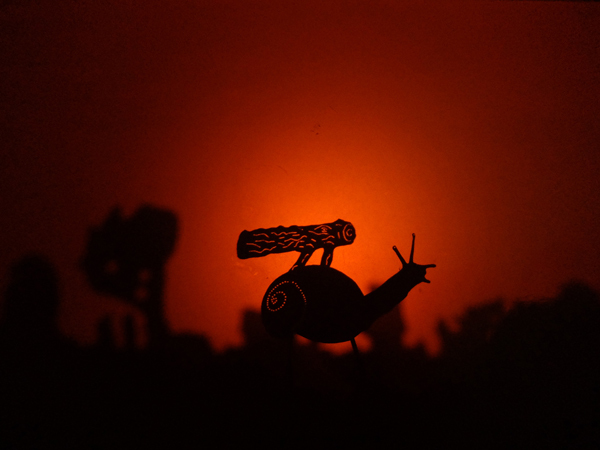 In recent years, stories of film origin have found their way into the shadow theatre. This is surprising since film has never gotten a hold beyond a limited audience despite the international recognition of more than a few of its filmmakers. 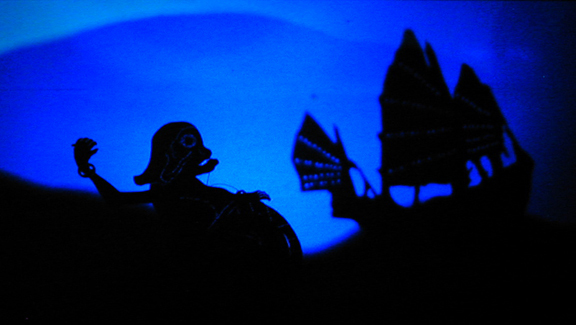 The great popularity of shadow theatre can be illustrated by the fact that time and time again the great Anaphorian filmmakers have returned to the shadow theatre bringing with it a new inspiration as well as a renewed respect. The Shadow Play, Ten Black Eye represents this new tradition that remains informed by combinations of past, present and its own future. The mixture and superposition of cultural influences have nurtured a shadow theatre that transcends being a mere conglomerate. Historically, due to its patronage, this theatre has been able to afford the luxury of larger ensembles. There is a trend toward the dispensing of the walls between the playing of music and the operation of puppets with those behind the screen producing shadows one moment and playing music the next. There is no fast and set rule though with some participating in one function. The polytheistic beliefs of the shadow troupes make the symbology of "multiple sources of light and shadow" meaningful. The result being the adoption of controllable electric light to separate parts of the screen and characters. This practice allows much of the screen at times to remain dark offending members of the older schools fearing a dominance of the dark forces. These opponents on the other hand recognize a marked difference between a darkness of evil and a darkness as "a basis of possible vibrations" and well as a symbol of "the vast unknown". 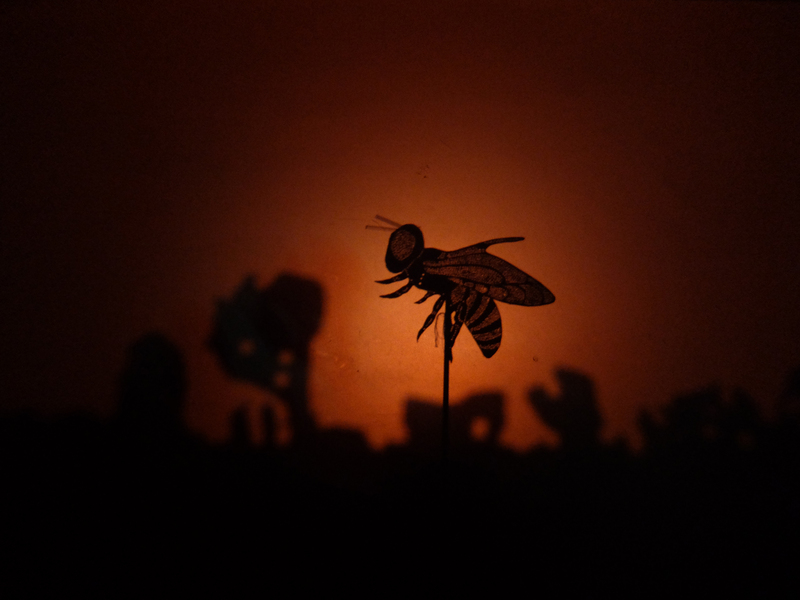 The music of the shadow play has a unique history. in the late nineteenth century, there occurred on our island what is known as the Great Missionary Expulsion. As a result, many western instruments were abandoned by their owners. For years they remained neglected. At one point, an instrument builder from Lipari realized that the reed organs could be retuned to a slendro-like scale and proceeded to do so. Very pleased with the sound, he spread the word. At first, the tuning was comprised of two sets of pentatonics, one slightly higher than the other. After some time they found that if they took the traditional Slendro scale and utilized a version derived from a 4,000 year old diagram known in India as Meru Prastara, the two remaining tones could be tuned as one of the scales implied by the diagram, thereby using all 12 retuned tones on the western instruments. Some attempts were made with pelog-like scales,but forming cycles of 5,7,9 or 14 tones did not fill out instruments with a 12 pitch cycle. Soon a whole array of retuned instruments emerged, deceptively looking like their western counterparts but bearing no resemblance in sound. 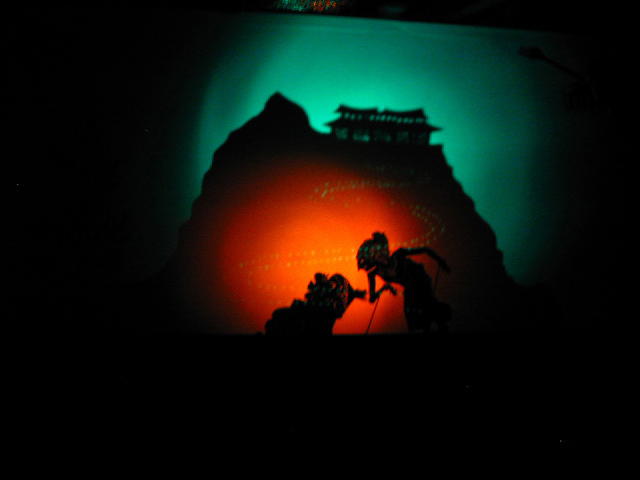 The instruments of the shadow theatre can be seen here. It is with great thanks we express our graditude to all those who have participated and left and everlasting mark upon this theatre. Here is an installation put together using recent puppets as an addition to our Shadow performance practices. Shadows of Exile by Kraig Grady from Gary Warner on Vimeo.